When I was a child I became fascinated the concept of forever. I tried to imaging it – forever – something that never ends. Since I grew up with the notion that eternity in heaven awaits us, I would try and imagine that. I tried to imagine existing in heaven, or in any form, forever. I tried to imagine a timeline stretching out into space and going on and on forever. And try as I might, I just could not. It even frightened me a little. How can something go on forever? Have no beginning and no end? If you really put your mind to that question it is bound to drive you a little insane. That is because we are wired to think in a linear manner. If you are thinking linearly, there is no way to understand the infinite. A line has to have a beginning and an end. Something has to come before, then after, then again after that, etc. The infinite is non-linear, it does not have a before and an after. In fact it does not have any quantity at all. You cannot add or subtract from infinity. 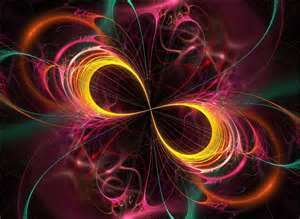 What is infinity minus 1, or infinity minus a zillion? There is no such number. Even a zillion is still a set quantity, large as it is, it is not infinite. There is no number in existence that can express the infinite, because there are no quantities in the infinite, it simply is. To help begin to grasp this concept let’s look at something which is infinite which is part of your common experience: the moment that we refer to as “now.” When did that ‘now’ moment begin? You could say, well, it began a second ago. But that is not the case, because that second is now in the past, it is no longer now. When does now end? You could say it will end in a second, but again, that second is in the future, it is not now. In reality, now has no beginning, and it has no end. You cannot add or subtract from the moment we call now. It is infinite. It is the only moment in existence. It is the only moment you ever have creative access to, so it is all there is. Past and future are only in the mind. Physics even tells us that time is an illusion. Physicists cannot come up with any ‘proof’ that time exists. In truth there really is no time, there is only now. However, what we perceive as time is actually the space in which evolution occurs. Evolution can only go in one direction, thus our perception of the linear nature of time. The past is therefore the space that contains our earlier forms, it contains the progression of evolution of your being to what you are. The past can be learned from, but does not need to influence your Now. The Now moment is a new creation, an opportunity to evolve and to release what needs to be released. Quantum leaps are possible and happen all the time, former ways of being do not need to be clung to in order to evolve, in fact clinging is what impedes evolution. In actuality the past has no bearing on the Now other than what we give it. The future, like the past, does not really exist, however the ‘future’ is about trusting within the Now moment, which means living without fear. Future is where fear lives for most of us. When we learn to live in trust instead of fear is when we begin to awaken to the infinite Now, and that is when those quantum leaps of insight, awareness or inspiration become possible. We cannot cross the gap with fear, it will always block our path. Trust is the only way forward. That is when we embrace the moment and harness its creative power, without needing the past to tell us what to do or how to do it. Are you an athlete who has experienced the ‘zone’, or an artist who has become completely consumed in your art form to the point you lose track of anything but your own self expression? Have you ever had a lightning bolt of insight or inspiration that just ‘comes’ to you? These are the experiences of knowing the infinite moment. You have no fear in those moments, you also have nothing from the past which holds you back. You are connected to the infinite. Meditation is the quickest way to find this space intentionally. Sit quietly and observe your breath. Let all thoughts that come to you pass through without judgment. Observe your thoughts without becoming or identifying with them. Find the awareness behind your thoughts. Slowly the stillness will seep in and in that stillness, you will find the infinite Now. Questions You Can’t Ask in Sunday School: Where did God Come From?